Fertigation typically requires fewer nutrients, control products and water than traditional methods. Fertigation is one way to give clients what they want—a greener, healthier lawn for less. Through fertigation, clients can have both. Fertigation is the process in which fertilizer is dissolved and distributed along with water in a drip or spray irrigation system each time the system runs. Fertigation-style injection systems also can be used to apply control products to keep a client’s lawn free of wildlife, mosquitoes and other pests. Although fertigation has been used for decades in commercial agriculture and horticulture, the process is also now being used in residential and commercial landscapes as the systems become more reliable and easier to use. In fact, Chaplinsky, president of Turf Feeding Systems, a Houston-based supplier of fertigation systems for landscapes, sports fields, golf courses and agricultural sites, said fertigation is the most efficient way to manage water, nutrients and landscape quality. Fertigation “spoon feeds” plants frequent, small applications, making it easier for them to absorb the nutrients. This method can result in strong, drought-tolerant plants that are less susceptible to insects and diseases. Because of its precision, fertigation requires less water and fertilizer than traditional application methods and can reduce the leeching of chemicals into the water supply. In addition to reducing water and fertilizer use, the need for herbicides and pesticides is also reduced due to the increased health of the overall landscape. As the costs of water and fertilizer continue to increase, experts agree that fertigation can be a solution. Because plants more efficiently absorb nutrients when the product is mixed with water, fertigation allows 90-95 percent of applied nutrients to reach the plants, Chaplinsky said, compared with 50 percent of nutrients applied through traditional methods that rely on rainfall or irrigation water to dissolve the product into the soil. Fertigation also can reduce water use by 50 percent and the use of chemicals and fertilizers by up to 60 percent while improving the quality of the plant material, he adds. Gilmore agrees that the financial savings fertigation can provide appeal to commercial properties. “Commercial properties are more open to adopting the technology due to quick ROI, results-driven programs and increased focus on sustainability,” he said. Marty DeNinno, president of Pinnacle Irrigation & Nightlighting in Haddon Heights, N.J., said homeowners are beginning to recognize the benefits of fertigation as an eco-friendly way to feed their lawns and landscapes. The company offers 70 percent irrigation services to a 90-percent residential clientele, and DeNinno said about 6-8 percent of his customer base receives fertigation services. DeNinno installs Ez-Flo systems, which he markets to his existing clients. He said homeowners are particularly attracted to organic pest control methods available through injection systems. These include the application of cedar oil, lemongrass oil, peppermint oil and garlic oil that prevent deer, moles, voles, rabbits and geese from destroying plants. 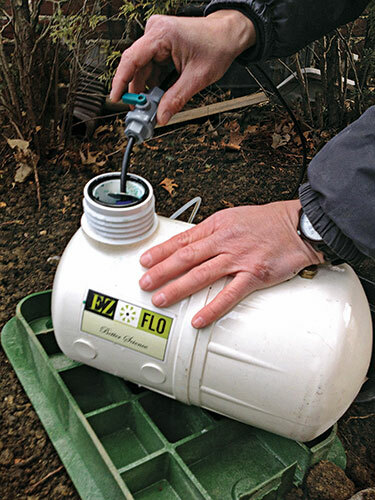 Pinnacle Irrigation can retrofit the Ez-Flo system to any existing irrigation system. The company’s fertigation offerings include installation, maintenance, refills and an annual system inspection. Installations of systems filled with product start at $650. One operator likens fertigation to a patient getting an IV rather than taking a pill. Also, check with your state to see if you need a license to apply fertigation-related products, he adds. Lawns by Dr. Vaughan in Chesterfield, Va., offers fertigation, lawn care and irrigation system repair services to a primarily residential clientele. 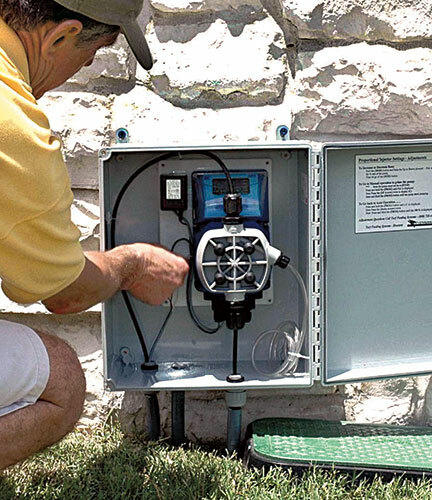 The company’s fertigation program includes bimonthly maintenance visits, during which it services and calibrates the pump and refills the system’s 10-gallon container. The pump is housed inside a decorative garden box and placed in an out-of-sight area of the client’s landscape. “We tell our clients that fertigation is essentially like getting an IV at a hospital instead of taking an oral pill,” said Diana Vaughan, owner of Lawns by Dr. Vaughan. Many of her clients have an interest in protecting the Chesapeake Bay and its surrounding waterways and appreciate the eco-friendly aspects of fertigation, she said. The company also works with its clients to highlight the importance of healthy lawn maintenance in addition to fertigation, including proper mowing, watering and disease control. Fertigated lawns stay healthier throughout the year and more quickly repair themselves should a problem occur, she adds.